The term 'Big Five' was historically used to denote the five most dangerous animals to hunt in Southern Africa. Fortunately the term is now used to describe the most popular and exciting animals to view, whilst on safari in the Kruger National Park. Height: 3m Mass: Up to 6000 kg, at birth the calf is 90 cm tall and weighs approx. 120 kg. Suckled until about 2 years old. Gestation: 22 months, single calf. Twins have been recorded but this is extremely rare. They breed throughout the year, one calf every 5 years or so. 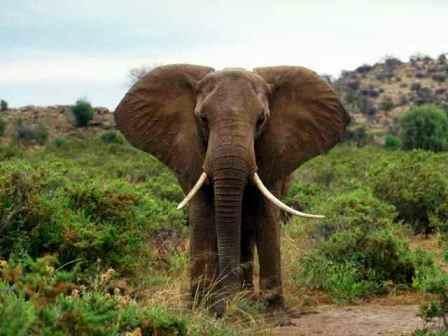 An elephant can eat up to 250 kg's of food a day and considering it's bulk, can reach a speed of up to 40 km/hr. Due to it's size however, it is incapable of jumping even a small ditch. It can swim and sometimes uses it's large trunk as a snorkel. The average lifespan is 60 yrs, this is due to the fact that during it's life cycle it goes through 6 sets of teeth (each lasting 10 years). Once the last set has gone the elephant cannot eat and therefore dies. The cow's forehead is angular whereas the bull's is more rounded. One should always approach elephants with great caution even though they have poor eyesight and hearing. Height: 1,6m Mass: 900-1000 kg Gestation: 15-16 months, single calf Speed: Maximum of 45 km/hr. A crusty, unpredictable and anti-social creature. Even the male and female adult have only a fleetingly passionate relationship before going their separate ways. It's smaller than it's white relative. 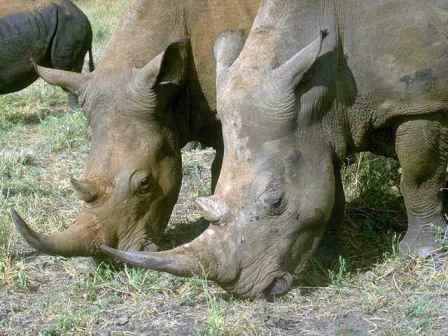 Distinguished from the white rhino by a prehensile upper lip, which is pointed or hooked. The head is held high when the animal walks. It is a browser unlike it's white relative. Lifespan approx 30 yrs. Calf always walks/runs behind or alongside it's mother. It has a different colour dung to that of it's relative. It's eyesight is poor but it possesses exceptional hearing and a good sense of smell. It is normally shy and solitary. Height: 1,8 m Mass: Up to 2000 kg Gestation: 18 months, single calf at intervals of 3 years. 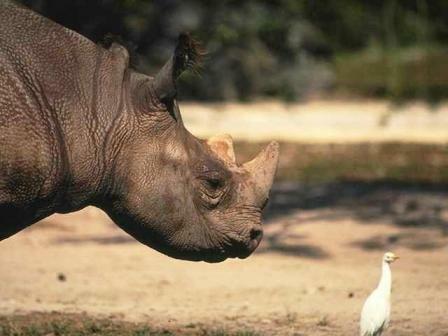 Also known as the square-lipped rhino, is the second largest animal living on land after the elephant. It is basically a placid creature and less irritable than it's cousin, the black rhino. There is no colour difference between the two and is distinguished from its cousin by a wide (where the name white originates from) square lip and pronounced neck hump. The calf always walks/runs in front or alongside it's mother. Height: 70cm Mass: 60-80 kg Gestation: 105 days. Although smaller than the lion, the leopard is fiercer, braver and very intelligent. It has exceptional hearing, good eyesight and sensitive, extra-long whiskers which help it avoid obstacles in the dark. A leopard is capable of leaping onto rocks up to 3m high, carrying prey 3 times it's own weight. The coat is covered in black rosettes and spots that are unique for each individual. The upper parts are light and tawny whilst the under parts are whitish. A leopard can run at speeds of 60 km/hr. They are also good swimmers and climbers and often spend time in trees. The call is a coughing, rasping sound. 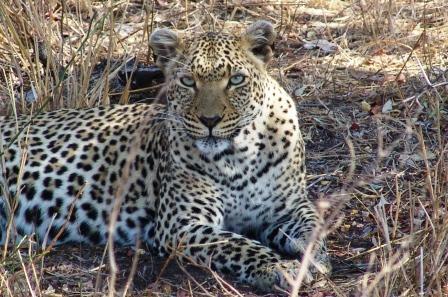 Leopards are solitary, secretive and mainly nocturnal animals. Height: 91-120 cm Mass: males 181-227 kg females 113-152 kg Gestation: About 120 days, they breed throughout the year. The "King of the beasts", is the largest carnivore on the continent and it's roar can be heard through the African night for up to 8km. Lions are very lazy and spend 15-20 hrs of the day inactive, resting on their sides or lying like domestic kittens on their backs with all four paws in the air. Lions are both diurnal and nocturnal. They are highly social animals and are found in prides and groups of up to 20 individuals. They prey on a wide range of species, including small rodents, and have excellent sight, hearing and sense of smell. Both males and females roar as a means of communication and territorial demarcation. 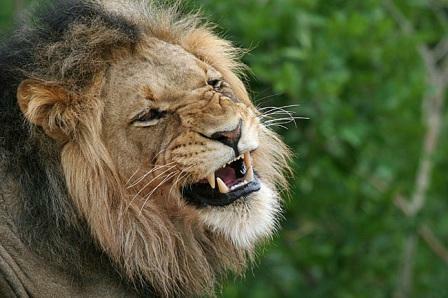 When lions have consumed a fair amount of blood, the dung is usually very black and strong smelling. It turns white if there is a high calcium content. Height: 1,5 m Mass: 600kg Gestation: 330 days, single calf. It breeds throughout the year with peaks in August and September. 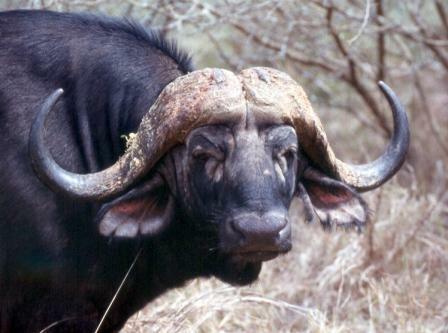 The buffalo is one of the world's most dangerous animals when wounded but unprovoked, it is an inquisitive and placid animal. They are intelligent and cunning and when threatened, have been seen to go into a defensive semi-circular formation with males facing outward on the perimeter, protecting the females and calves within. They are good swimmers and are fond of wallowing. They are preyed upon by lion which are invariably found trailing large herds. They are grazers but occasionally browse on shoots, twigs and bushes.